The most prestigious individual award available to NRL players is the Dally M Medal: it is the equivalent of the AFL’s Brownlow or the NBA’s MVP. The Dally M is named after Herbert Henry “Dally” Messenger. Messenger was an early pioneer for rugby league in Australia, having played for Eastern Suburbs (now Sydney Roosters), New Zealand, Australia, New South Wales and Queensland. Messenger was clearly a jack of all trades and a star centre. 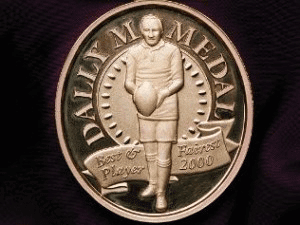 First conceived in 1980 by the Daily Telegraph, the Dally M was considered the second-highest single player’s award, behind only the Rothman’s Medal. That all changed in 1998 after the ARL and Australian Super League joined forces from a bitter split to create the National Rugby League. From then on the Dally M Medal was the premier players award available. Current North Queensland Cowboys halfback Johnathan Thurston holds the record for the most Dally M wins with his collection of four. We trust the following online bookmakers with our Dally M Medal bets. It is always worth having multiple bookie accounts so you get the most bang for your buck. Roger Tuivasa-Sheck took out the coveted Dally M last season. The New Zealand Warriors star should be in the mix again in 2019, but he will have stiff competition from the likes of Kalyn Ponga, James Tedesco, Gareth Widdop, Cameron Munster and the evergreen Cameron Smith. How does the Dally M Medal work? At the end of each game of NRL played, commentators across several news mediums and networks award three points, two points and one point to the players they feel performed the best during the game. The votes are publicised up until round 16, then the voting is kept under wraps. If a player is suspended, they will suffer a penalty of three Dally M votes for each week they are under suspension. The medal is awarded to the player with the highest personal score at the end of the regular season of NRL. The award ceremony is held at The Star casino in Sydney. A Dally M Team of the Year is also announced with the best players from each position named. This once translated to the first-choice team for the Kangaroos, but that tradition has gone by the wayside with more Kiwis and other internationals running around in the NRL. How do I bet on the Dally M? Betting on the Dally M Medal is a breeze these days. Simply log on to one of our recommended online bookies, go to the NRL page on their site and locate the NRL futures betting markets and locate the Dally M Medal markets. From there simply make your bet, sit back and watch heaps of footy. First and foremost, be aware of who is in the lead of the Dally M tally at the end of round 16, because that is when points given are kept secret. From there, the best way to keep informed is to simply watch the NRL. Each game ask yourself a couple of simple questions: Who was the man of the match? Who gained the most metres? Who created the most scoring opportunities? You can find out who the Dally M judges are for that year and follow them on Twitter, watch them on TV, or read their newspaper columns for clues as to who impressed them during each round. Even set up your own points tally on your fridge to gauge who may be leading the points. The best tip though is to look around for the best price for the bet you want to make. As shown above, the odds can differ greatly from bookie to bookie, so don’t be afraid to shop around to get the best value for yourself and the bet you want to make.